Use the front-wheel drive control switch to select the following transfer modes. Use this for normal driving on dry hard-surfaced roads. This position gives greater economy, quietest ride and least wear. Use this for driving only on tracks that permit the tires slide, like off-road, icy or snow-covered roads. This position provides greater traction than two-wheel drive. The four-wheel drive indicator comes on. Use this for maximum power and traction. Use L4 for climbing or descending steep hills, off-road driving, and hard pulling in sand, mud or deep snow. The four-wheel drive and 4LO indicators come on. Stop the vehicle completely with brake pedal help down. Push and turn the front-wheel drive control switch fully clockwise. If the four-wheel drive indicator flashes and the buzzer sounds, try the above steps again. Stop the vehicle or reduce your speed to less than 2 mph (3 km/h). Depress and hold the clutch pedal. Turn the front-wheel drive control switch counterclockwise. Reduce the vehicle speed to less than 62 mph (100 km/h) and turn the front-wheel drive control switch fully clockwise. Turn the front-wheel drive control switch fully counterclockwise. This can be done at any speed. You need not depress the clutch pedal. • If the four-wheel drive indicator continues to blink, drive straight ahead while accelerating or decelerating. • If the four-wheel drive indicator continues to blink and the buzzer sounds, stop the vehicle or reduce the vehicle speed to less than 62 mph (100 km/h). Operate the switch again. If the four-wheel drive indicator continues to blink, drive straight ahead while accelerating or decelerating, or drive forward or backward in a short distance. If the 4LO indicator continues to blink when you operate the front-wheel drive control switch to the H4 or L4 position, drive forward or backward in a short distance, then stop the vehicle completely, shift the shift lever securely to N and operate the switch again. 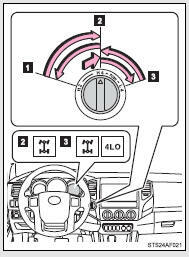 If the 4LO indicator continues to blink when you operate the front-wheel drive control switch to the H4 or L4 position, drive forward or backward in a short distance, then stop the vehicle completely, depress the clutch pedal and operate the switch again. If the indicator light continues to blink even if doing so, contact your Toyota dealer as soon as possible. There may be a trouble in the four-wheel drive system. VSC is automatically turned off. You should drive in four-wheel drive for at least 10 miles (16 km) each month. This will assure that the front-drive components are lubricated. ●Never shift the front-wheel drive control switch from H2 to H4 if the wheels are slipping. Stop the slipping or spinning before shifting. ●For normal driving on dry and hard surface roads, use H2 position. Driving on dry and hard surface roads in H4 or L4 position may cause drive component oil leakage, seizure, or other problems resulting in an accident. Further, it may cause tire wear and increased fuel consumption. ●Avoid turning suddenly in H4 or L4 position. If you do turn suddenly, the difference in turning speeds between the front and rear wheels may have a similar effect to braking, thus making driving difficult.